“Are you ready to skate for Sarah?” This was the rally cry uttered by local on air sports personalities including TSN’s Michael Landsberg, ESPN’s Dan Shulman and ET Canada’s Rick Campanelli among others. Together, this group along, with the JCCs of Greater Toronto, helped mobilize and draw support from the community to promote the inaugural “Skate for Sarah” Ice Hockey tournament, which took place this past Sunday at Pavilion and Rosemount Arenas in Vaughan. Sarah Watkin was a very brave 7 year old girl who lost her life to blood cancer in November 2014. After she passed away, Sarah’s family and friends vowed to keep her memory alive. They began to reach out to the community to help drive awareness on the importance of blood and marrow donors. The inaugural hockey tournament, organized by the JCCs of Greater Toronto, a beneficiary agency of UJA Federation of Greater Toronto, in partnership with Chai Life Line, brought out family, friends and members of the community, all of whom were in some way touched by Sarah’s story. 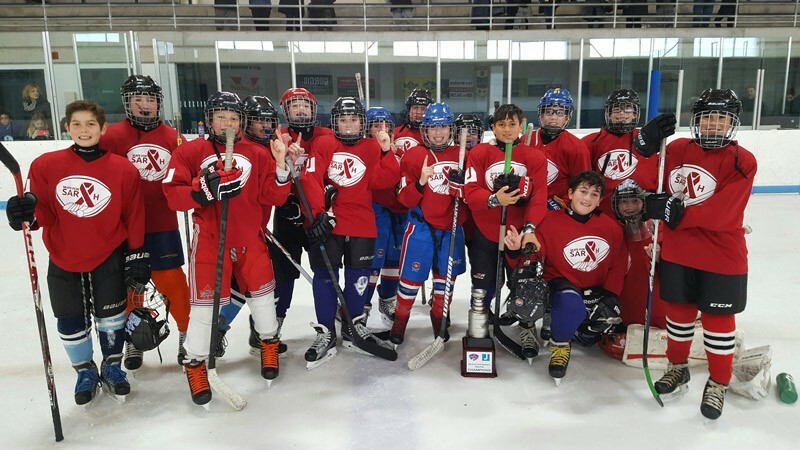 The one-day ice hockey tournament helped raise over $40,000 for children dealing with pediatric disability and illness, and for youth scholarships for sports and recreational programs. The event was kicked off with a few words from Vaughan Mayor Maurizio Bevilacqua and Mark Watkin, Sarah Watkin’s father. “Sarah would have loved this. Today is about hope, and because of your support we will be able to be able to provide hope to so many children. Thank you, thank you, thank you." Vaughan Councillors Alan Shefman and Sandra Yeung Racco were also in attendance. Most of this money was raised by kids who are active participants within the JCC and Chai Sports community. Changing the community, literally one game at a time, this event marked the ultimate journey for athletes. Championing Skate for Sarah was the leadership at JCC Chai Sports, a division of the JCC's of Greater Toronto, experts in sports programming from developmental and recreational to competitive. On the ice, teams were split into divisions for youth and adults. Off the ice, participants were treated to entertainment, family activities, food and prizes including: A Private Suite at Toronto Maple Leaf Hockey Game, NHL Draft experience in Buffalo, and an all expense trip to Las Vegas. Over 1,000 people attended the event demonstrating the value and power of community and the spirit of giving. Above all, they paid great tribute to the memory of the brave, late Sarah Watkin.